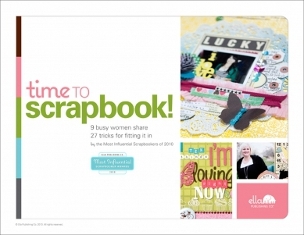 Over the years, I have collected many Scrapbook Publications from magazines, hard-cover books, and pamphlets, but I have recently discovered the new trend for scrapbook instruction & sample books from a great little company called Ella Publishing - Scrapbooking E-Books! One of the nice things I like about Ella Publishing, is that you actually get to take a look at a few pages of the books before you commit to a purchase. And, they are really inexpensive. As you move on down the page to look at the various e-books, keep your eye out for the Free Super Sampler, which will let you download a great assortment of pages from various books for free. If you see any of these Scrapbook Publications that strike your fancy, just click on the book cover. 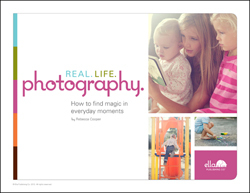 The newest of the scrapbook publications from Ella Publishing is a great little e-book called "Real Life Photography"...Learn how to take amazing photos is real-life situations. "Simple Fixes" contains 8 actions for PS and PSE featured in the Real Life Photography e-Book. And, a NEW EBOOK BUNDLE: Photography Ideas Bundle. 3 great eBooks for the price of 1. Another great e-book callled 31 Thank you cards is also available. 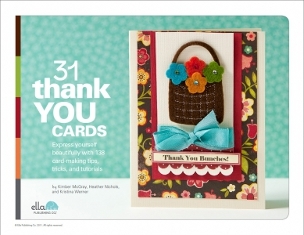 As you complete your 31 Thank You cards, you will be familiar with 138 card making ideas including stamping, embossing, stitching and embellishing from the crafters Kimber McGray, Heather Nichols, and Kristina Werner. And, of course, these great techniques can be used on any type of card all year long. 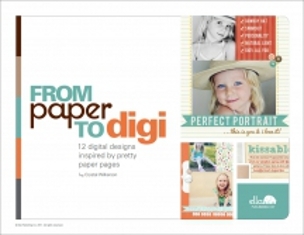 In another new Scrapbook Publication, From Paper to Digi written by Crystal Wilkerson, you will receive a free digital paper pack with the purchase. You will be able to create 12 layout designs which were all inspired from paper layouts. A wonderful publication entitled Don't Say Cheese! 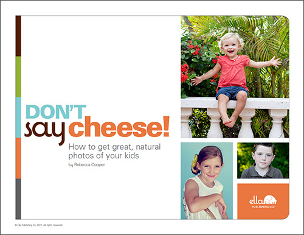 will provide you with 247 expert tips for taking great photos of your kids. It focuses on getting the best smiles and expressions from your children by expert photographer (and best-selling author) Rebecca Cooper. You'll love Rebecca's insider tips, posing tricks, photo games, and photo-taking checklists, all wrapped up in a 52-page package you can download instantly. 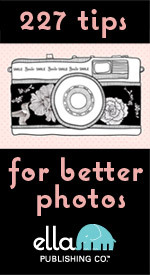 A must for any mom with a camera! To Review and/or Purchase - Don't Say Cheese! Ella was founded by Angie Lucas and Lain Ehmann's and now consists of Angie Lucas and Wendy Smedley. All three ladies were editors or contributors of the Simple Scrapbooks magazine which sadly folded in early 2009. I was a subscriber and was very sad to see the magazine go. 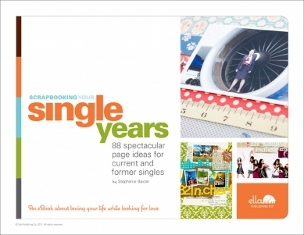 Soon after that, Ella Publishing was formed and the great little Scrapbooking E-Books they publish are just wonderful. Scrapbook Publications like these Scrapbooking e-Books can be stored and used directly on your Computer or they can be printed out on regular 8.5 x 11 inch paper and added to a 3-Ring Binder. There is a printing tutorial to help you with ways to print and pitfalls to avoid. Their website even shows you how to create several different kind of books and bindings for their PDF files, which can be printed using Adobe free down-loadable software. Or, You can just view and use these Scrapbook Publications on your Computer! 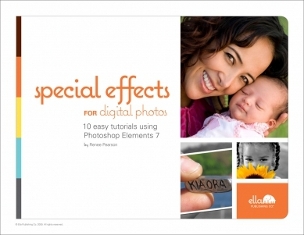 Special Effects for Digital Photos -- 10 easy tutorials using Photoshop Elements 7, by Renee Pearson. 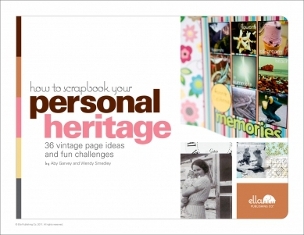 How to Scrapbook Your Personal Heritage -- 34 vintage page ideas and fun challenges by Wendy Smedley & Aby Garvey. 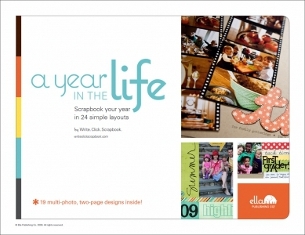 A Year in the Life -- Scrapbook your year in 24 simple layouts, by Write. Click. Scrapbook. 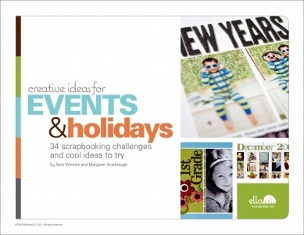 Creative Ideas for Events & Holidays -- 34 scrapbooking challenges and cool ideas to try by Sara Winnick & Margaret Scarbrough. 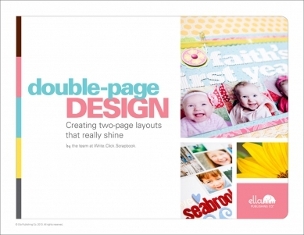 Double-Page Design -- Creating two-page layouts that really shine by Write.Click.Scrapbook. 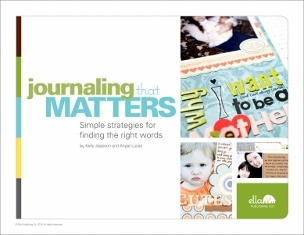 Journaling That Matters -- Simple strategies for finding the right words by Angie Lucas and Kelly Jeppson. 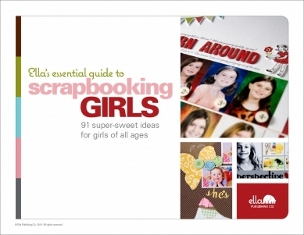 Ella's Essential Guide to Scrapbooking Girls -- 91 super sweet ideas for girls of all ages by Five Moms of Girls. 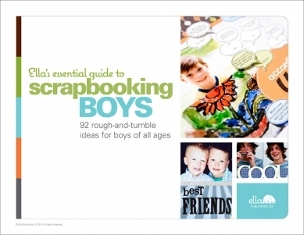 Ella's Essential Guide to Scrapbooking Boys -- 92 rough and tumble ideas for boys of all ages by Five Moms of Boys. Time to Scrapbook! -- 9 busy women share 27 tricks for fitting it in by the Most Influential Scrapbookers. To Review and Purchase - Time to Scrapbook! 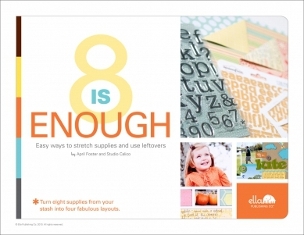 Eight is Enough -- Easy ways to stretch supplies & use left overs by April Foster and Studio Calico. 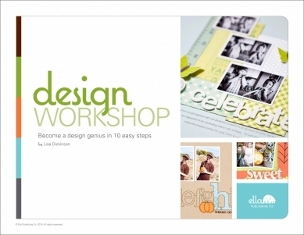 Design Workshop -- Become a design genius in 10 easy steps by Lisa Dickinson. 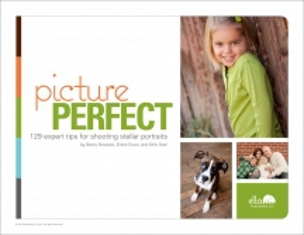 Picture Perfect -- 129 expert tips for shooting stellar portraits by Becky Novaceck, Elisha Snow & Kelly Noel. 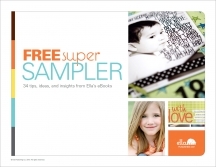 Free Super Sampler -- 34 tips, ideas, and insights from Ella's e-Books by Ella Publishing Co.
Take advantage of this Free Super Sampler! 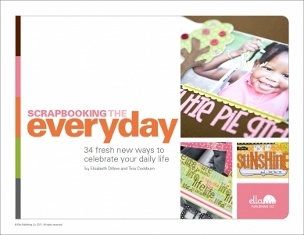 It was the first one I downloaded and it really gave me a great idea of what the Scrapbooking e-Books from Ella Publishing look like and what great ideas they have. UR2 Cre8ive -- 68 playful ways to unleash your creativity by Stacy Julian. 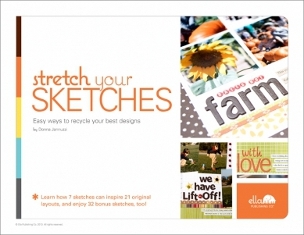 Stretch Your Sketches -- Easy ways to recycle your best designs by Donna Jannuzzi. 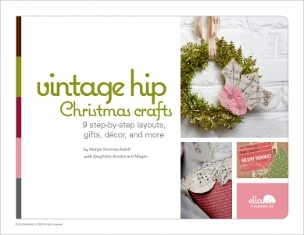 Vintage Hip Christmas Crafts -- 9 step-by-step layouts, decor, gifts, and more by Margie Romney-Aslett, with daughters Megan & Brooke. 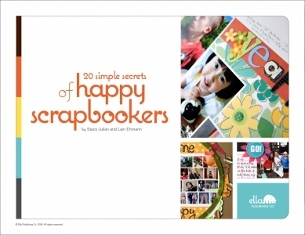 20 Simple Secrets of Happy Scrapbookers -- Positive proof that scrappers are happier! by Stacy Julian and Lain Ehmann. 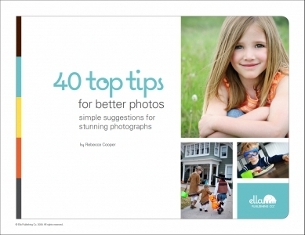 40 Top Tips for Better Photos -- Simple suggestions for stunning photographs by Rebecca Cooper. 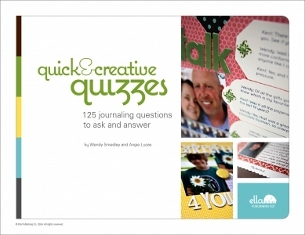 Quick & Creative Quizzes -- 125 journaling questions to ask and answer by Wendy Smedley & Angie Lucas. 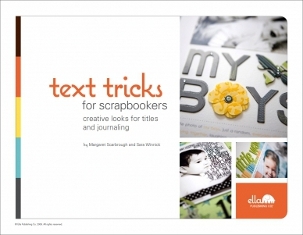 Text Tricks for Scrapbookers -- Creative looks for titles and journaling by Margaret Scarbrough & Sara Winnick. I wanted to show you this unique form of Scrapbook Publications and I hope you will take advantage of at least the Free Super Sampler. I have many, many magazines and books devoted to crafts, scrapbooking, card making and sewing and I like these Scrapbook Publications that I don't have to find a place for on a book shelf. These great Scrapbook Publications are stored on my computer, take up no extra space, and even if it crashes, I will be still be able to download another copy, so all will not be lost.